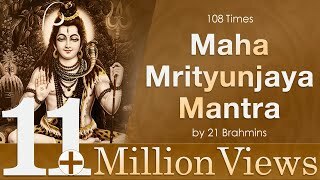 Maha Mrityunjaya Mantra OM Triyambakam Yajamahé Sugandhim Pushtivardhanam Urvarukamiva Bandhanan Mrityormukshiya Maamritat The Mahamrityunjaya Mantra has been cited in the ancient scripture, Rigveda. It is believed that the origin of this mantra is related to the rigorous austerity performed by the sage Shukracharya. Allegedly, the sage had subjected himself to an exacting practice that involved hanging upside down from a tree branch for a period of 20 long years. It is said that Lord Shiva was pleased with this severe austerity and blessed him by bestowing this mantra. This mantra is also alluded to as the sanjeevani mantra, a panacea for all maladies. The recitation of this mantra is believed to cure mental afflictions and sufferings as well as all fears are surmounted. In particular, one is liberated from the fear of death. 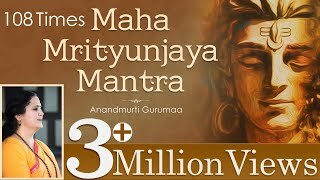 The featured chanting of Mahamrityunjaya Mantra in ethereal voice of Anandmurti Gurumaa is enlivening, uplifting and engrossing that absorbs one into the essence of the mantra. The essential meaning of the mantra is as follows: 'OM' denotes the omniscient, omnipresent, eternal, bliss, supreme consciousness. 'Triyambakam' refers to the three eyed Lord Shiva, the one who is the essential foundation of the entire gross, subtle and causal universe. Three also refers to the three attributes of rajas, tamas and sattva. 'Yajamahé' means we hereby worship you. 'Sugandhim' implies that the Lord Shiva resides within me and his fragrance is pervading the entire universe. 'Pushtivardhanam' expresses that it is Lord Shiva who imparts nourishment and strength to our body, mind and prana (cosmic energy). 'Urvarukamiva' conveys that may all diseases and fears get eradicated; may all my afflictions and suffering get uprooted similar to the effortless falling of a ripened fruit from the tree. 'Bandhanan' refers to all bondages and hindrances; may the shackles of all bondages be broken, freeing me forever. 'Mrityormukshiya' indicates save me from death, especially sudden untimely death. O Lord, grant me liberation from this endless cycle of birth, suffering, death and rebirth (moksha). 'Maamritat' denotes O Lord bestow on me with the nectar of such an elixir. The recitation of this mantra should be done with utmost devotion and faith. Body and mind need to be cleansed and pure. The recitation is to be done whilst being seated on a clean mat, the spine should be erect and the eyes are kept closed. Breathing should be slow and deep. Take care in pronouncing the words correctly. Be focussed and recite from your heart, with integrity and full devotion. May the merciful Lord Shiva bless you all with his grace and compassion!